Located on the eastern fringes of the Great Plains of North America, much of Missouri is a fertile prairie land dissected by rivers and streams. In the west, south of the Missouri River, the Osage Plains stretch to its border with Kansas; it's a mixed tallgrass prairie land with scattered woodlands. In the southern areas of Missouri the Ozark Plateau (also covering portions of Arkansas, Illinois, Kansas and Oklahoma) dominates the landscape; it's a beautiful area of heavily forested hills and low mountains, as well as caves, lakes and rivers. In the southeast region stand the St. Francois Mountains, and the highest point within the state, Taum Sauk Mountain. Missouri's lowest point is found along the St. Francis River in the "Boot Heel" region, along its southeastern border with Arkansas. 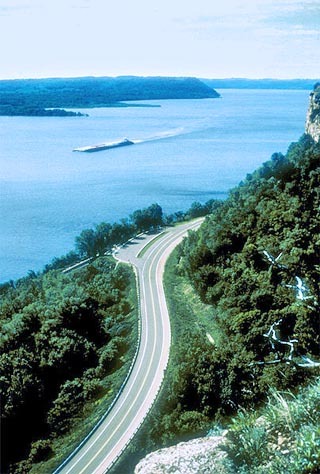 Two of America's most important rivers flow through the state; the Mississippi River forms its entire eastern border, and the Missouri River slices the state almost in half. Many additional rivers (tributaries of the Mississippi and Missouri) drain the state, and countless streams enrich the farmlands. Major lakes in Missouri (many created by river damming) include Lake of the Ozarks, Table Rock Lake, Stockton Lake, Clearwater Lake, Lake Wappapello, Truman Reservoir, and Bull Shoals Lake on its southern border with Arkansas. For a closer look at the overall topography of Missouri, view this topographic map!